Rhinos Who Skateboard is great book for the future little ripper in your life. Julie Mammano has taken the humble rhinoceros and given them the extreme sports treatment. (Only board sports, thank you.) 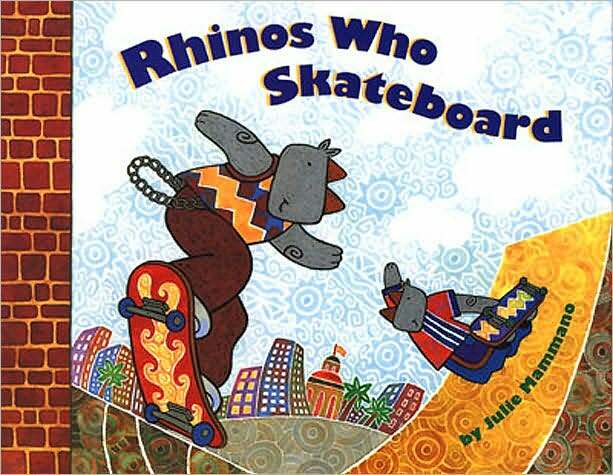 Rhinos Who Skateboard is vibrantly illustrated and features some colorful language too, which is backed up with a glossary of terms. So if you give this book to a kid with non-skater parents, they can quickly define a “Sesh” a “Pole-jam”, or a “Geekfest” (longboarding Alligators are a geekfest) This was published in 99, so plenty of copies are floating around Amazon. My nephew is three and both his father and I are card carrying “old-man skaters”. The kid loves this book and naturally we would like him to find joy in the same activities that we do. Since skateboarding is not exactly a “sport” and is often taken up by lonely kids with no parental involvement this seems a good avenue to get him psyched on the sport before he can really participate.